Thousands of years after the destruction of our civilisation, Earth is divided into what is known as the Four Lands, whose inhabitants are a mix of races including elves, dwarves, trolls, gnomes and humans. At the centre is the Shannara family, whose descendants are empowered with ancient magic and whose adventures continuously reshape the future of the world. As the story begins, dark and terrible forces thought to be confined for years, begin to escape. When Amberle, a young elven princess; Wil, the last descendant of the Shannara family; and Eretria, a human rover learn that only they have the power to stop the advancing evil, they form an uneasy alliance. Their seemingly impossible quest to save the world becomes a voyage of self-discovery as they find the inner strength to overcome self-doubt and fear, and embrace their destinies. The 'The Shannara Chronicles Season 1' competition has now closed. Winners will be announced shortly. Competition opens at 5:30pm AEDT on Sunday 27th March 2016 and closes at 11:59pm AEST on Sunday 3rd April 2016. Five winners will be chosen at random on Monday 4th April 2016. To successfully win, entrants must fulfil the above entry conditions before the time the competition closes. Current members/followers are eligible to enter the competition. Only one entry per person. Only one winner per household. To be a valid winner, the entrant must not have won a prize from SWITCH within the last 28 days. Each winner will receive one Blu-ray copy of 'The Shannara Chronicles Season 1'. By entering, you agree to receive occasional emails from SWITCH in the future. If you decide to unsubscribe from these updates, any further entries will not be applicable. Only Australian residents are eligible to enter. 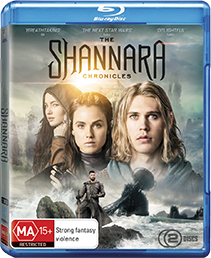 'The Shannara Chronicles Season 1' is available on Blu-ray, Digital and DVD on Wednesday the 30th March 2016 from Roadshow.